The political warfare being waged by the Marxist and Islamic Counter-States is culminating one week before elections in the U.S. just as the enemy planned. Marxist/democrat operatives created and executed a plan using FBI leadership, foreign intelligence assets, and others to put forth an overtly false FISA application to obtain technical surveillance on the man who is now President of the United States in order to seditiously and treasonously remove him from office. Elements from the Marxist & Islamic Counter-States, primarily George Soros funded and Muslim Brotherhood groups, counter all efforts by the President to protect America’s borders, sovereignty, and national security. Example given: the Muslim Association of Hawaii, a Muslim Brotherhood organization, directly opposed the President’s plan to limit immigration from hostile nations. Without any evidence or corroboration, Soros funded Marxist organizations and others made false accusations against Supreme Court nominee Kavanaugh, physically disrupted the hearings, and publicly acted to destroy his reputation. Antifa and other violent left-wing organizations, in league with the Islamic Movement in the United States, threaten violence against anyone speaking truthfully about the threat of Islam. This includes threats made by Antifa to hotels hosting presentations by Understanding the Threat (UTT) this past spring. A week before the elections, people speaking truth about these matters, like UTT President John Guandolo and investigative journalist Laura Loomer have been banned from Twitter. Meanwhile, a Marxist-funded mob is moving from Central America to the U.S. Southern border to invade America, and this is timed to happen on election day or thereabouts. Fake bombs were sent last week to key Marxist leaders and activists including former President Obama, former Attorney General Eric Holder, former Director of Central Intelligence John Brennan, and others using methods that ensured the devices would be detected and discovered, revealing this was an information operation in support of the larger Marxist/democrat agenda. Key leaders of the Marxist counter-state in the U.S., to include former President Obama and former Attorney General Eric Holder, openly call for violence just as their Marxist (Alinsky) training instructs them to do. In June of 2017, Congressman Steve Scalise was shot on a baseball field by a democrat and supporter of President Obama. 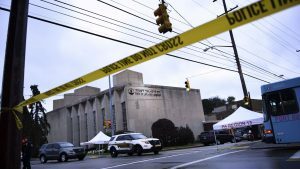 The attack over the weekend at the Tree of Life Synagogue in Squirrel Hill – a suburb of Pittsburgh, Pennsylvania – in which 11 Jewish people were killed, was perpetrated by an overt nazi-supporter who also supports Barack Obama and hates President Trump. Robert Bowers, the assailant, stated, “They’re committing genocide to my people. I just want to kill Jews.” Who are his “people?” The “Palestinians”/Hamas is the only group claiming Jews (ie Israel) are committing genocide against them. Was Bowers claiming solidarity with Hamas and the Islamic Movement? Evidence in the largest terrorism financing trial ever successfully prosecuted in American history – the US v Holy Land Foundation for Relief and Development, Northern District of Texas (Dallas), 2008 – reveals the North American Islamic Trust (NAIT) is a Muslim Brotherhood organization which provides money directly to Hamas leaders and Hamas organizations overseas. Hamas is a designated Foreign Terrorist Organization (FTO). Declassified FBI documents reveal NAIT is a funding arm for the jihad inside the United States in league with many other Muslim Brotherhood organizations. The Muslim Brotherhood’s (MB) By-Laws state the objective of the MB is to establish an Islamic State under sharia. Sharia mandates that Jews must be holocausted so muslim can go to paradise. 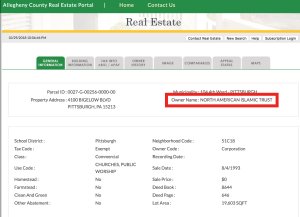 The Islamic Center of Pittsburgh, which has “raised” over $100,000 for the Tree of Life Synagogue in Pittsburgh, is owned by the North American Islamic Trust (NAIT), which means it is a Muslim Brotherhood Islamic Center/mosque which seeks the destructions of Jews. Therefore, the logical question: Since the Islamic Center of Pittsburgh is a Muslim Brotherhood organization which seeks to establish an Islamic State under sharia (Islamic Law) which mandates the destruction of Jews, why would they donate so much money to a synagogue? The Islamic Center of Pittsburgh is a hostile jihadi organization and, like the Muslim Brotherhood’s Islamic Society of North America (ISNA), also a direct funding arm for the terrorist group Hamas which donated money to the families of the victims of the Fort Hood, Texas massacre, they do it to buy off the community and the victims so they will not see the Islamic threat for what it is. The money given by the Muslim Brotherhood’s Islamic Center of Pittsburgh to the Tree of Life Synagogue is blood money. It is a small price for the jihadis to pay to silence the Jewish community in Squirrel Hill and elsewhere. Why do Jewish leaders defend the Muslim Brotherhood and Hamas in America? One reason is that many Jewish leaders foolishly take the muslim leadership at their word instead of actually reading sharia which mandates muslims to lie to non-muslims when the goal is obligatory – ie jihad. UTT encourages readers to look at all that is going on through the lens of the Marxist and Islamic Counter-States which are aggressively moving their war to take down America’s Constitutional Republic forward. Americans must believe what they are seeing, understand Marxist doctrine and sharia (Islamic Law), and work locally to purge the enemy from your midst. The donation from NAIT was marketing and silencing…..so as to not shine a bad light on the ideology ….there are many mosques in surrounding area which could be a concern if sharia law is understood. Had G.W. Bush abided by his presidential oath in response to Saudi-Arabian government funding of the 9/11 attacks, by declaring war* on behalf of the American people rather than succumbing to an apparent familial proclivity for the commission of treason — I.e., surprise “attacks” which claimed hundreds more of innocent lives than did the Empire of Japan’s airborne naval attack on Pearl Harbor — U.S. Code Title 50-Chapter 3, article 2 , “War and National Defense” would have long-since been invoked, thus enabled the country to rid itself of an ongoing 17-year incursion by sharia-adherent Muslims, aged 14 or older, by means of apprehension, restraint and removal. Furthermore, the hundred thousand-dollar donation by the Muslim Brotherhood to the Pittsburgh religious site where the recent massacre of American Jews took place, provides a periodic return on what more probably than not derived from U.S. & State welfare extortions by sharia-adherent aliens obligated to help fund Islam’s global 14-century war on Western civilization. I.e., NAIT’s deed-rooted recall rights relevant to its thousands of properties, 80% of which are backed by Saudi Arabian money, is no less enforceable with respect to a synagogue than it would be to any other real estate rental entity. Thus, given that Saudi Arabia’s most abundant resource is reputed to be money — by virtue of mega-expenditures involving “gifts”, U.S. educational endowments focusing on philosophical control of our entire educational system (including K-12), comprehensive legal acceptance of Sharia in American courts and ever closer proximity to high ranking federal officials willing to advance said overtures in the United States Congress, Saudi Arabia already regards the United States as nothing more than a decadent colony populated by malleable infidels worthy of nothing more than enslavement under Sharia. *Anyone wishing to have an authentic Arabic-to-English translated verbatim copy of Islam’s declaration of war on Western civilization (I.e., on “Us”) can order a personal copy of said document, which was seized by Special Agents of the FBI in accordance with a federal search warrant from a subterranean basement in Annandale, Virginia, in 2004, by contacting http://www.securefreedom.org to request (for a nominal handling & postage fee), GOVERNMENT EXHIBIT 003-0085 3:04-CR-240-G U.S. v. HLF, et al.